The surprising research showing peptide adaptability was published September 17 in Nature Chemical Biology. Brian Baker, the John A. Zahm, C.S.C., Professor of Structural Biology and chair of the Department of Chemistry and Biochemistry, was principal investigator on the study and worked with co-authors from Notre Dame as well as Stanford University, Loyola University, and the University of Kentucky. “Essentially, we discovered that T-cell receptors can be much more cross-reactive than we previously envisioned, which is somewhat concerning for the entire field,” said lead author Timothy Riley, Ph.D. ’17, Baker’s former graduate research assistant and now co-founder and chief scientific officer of startup Structured Immunity, a company incubated through Notre Dame’s IDEA Center that aims to de-risk early stage immunotherapeutics. Scientists knew there were many millions more peptides, or antigen targets, than TCRs. They expected that the receptors recognized and adjusted to many different peptides that have similar properties. In the case of the TCR studied in the current research, DMF5, researchers knew it recognized hydrophobic peptide antigens, which are water-insoluble. But K. Christopher Garcia, the Younger Family Professor and Professor of Structural Biology at Stanford University, alerted Baker to an anomaly uncovered in his own research. Garcia noticed that DMF5 also appeared to bind with a different class of peptides—one that was highly charged and easily dissolvable. 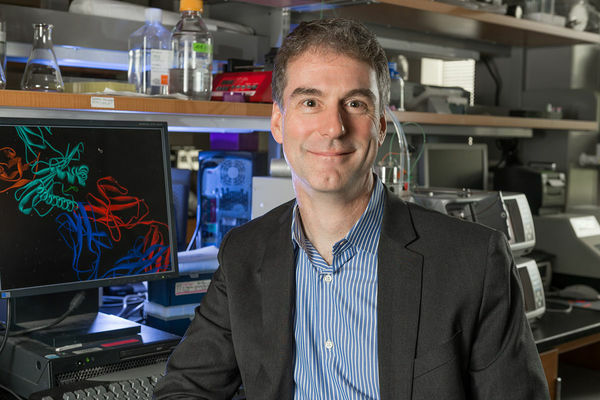 The discovery is notable for increasing the understanding of how to develop immunotherapies, but it’s an unexpected challenge to overcome, Baker explained. Although the current research was completed on just one TCR and only two peptides were evaluated, he noted, it’s likely that others may function in a similar way. Co-authors in addition to Riley and Garcia include Lance M. Hellman at Notre Dame; Marvin H. Gee, Juan L. Mendoza, and Jesus A. Alonso at Stanford; Kendra C. Foley and Michael I. Nishimura at Loyola, and Craig W. Vander Kooi at Kentucky. The study at Notre Dame was funded by grants from the National Institutes of Health (NIH), the American Cancer Society, and fellowships from the Indiana Clinical and Translational Sciences Institute. The research was also supported at Stanford by the NIH, the Howard Hughes Medical Institute, and the Parker Institute for Cancer Immunotherapy. Originally published by Deanna Csomo McCool at science.nd.edu on September 18, 2018.